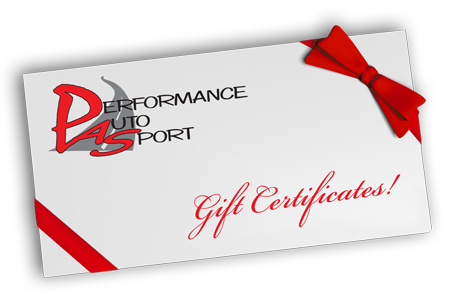 Gift Certificates - Performance Auto Sport Inc.
Give the gift for Performance Auto Sport! A Gift Certificate to Performance Auto Sport makes the perfect gift for Christmas, Birthdays, Valentine’s Day, Mother’s Day, Father’s Day or any other special occasion. Now you can purchase them quickly and easily online and if you’d like, have them sent directly to your recipient. Gift Certificates can also be purchased in person. Purchase a Gift Certificate today! Gift Certificates will be processed and sent out regular mail the business day following the transaction. All your payments are processed securely by PayPal. You do NOT need a PayPal account. There are no additional costs to you to make this purchase, no matter which payment method selected. · Using the Pay by PayPal System using your PayPal account or Credit Cards.